In the Basement Warehouse in Upland, CA on day 7. We shot two full scenes down here throughout the day. 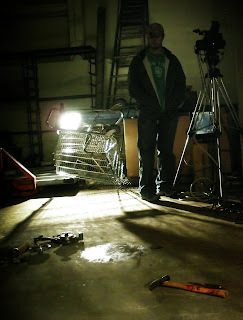 Brock and I finally got to tackle a few creative lighting setups today, which was a nice change. Most of the days so far have been day exteriors so we've just been doing minor tweaks and battling the changing sun up to this point. So it was nice to finally get to create a "look" for a location. The location itself had a lot of character. So we just tried to accent that and throw in a few twists of our own.